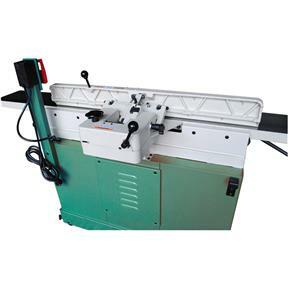 The beauty of a parallelogram jointer is the four points of contact allowing for easy adjustment of each table for perfect alignment. 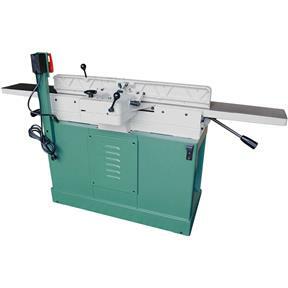 Plus, parallelogram jointer tables feature arched table travel, keeping each table close to the cutter, adding an additional degree of safety during operation. Setting cut depth is a breeze for traditional jointing or rabbeting with the infeed and outfeed adjustment levers. With the G0857 and G0858 Parallelogram Jointers, you know you're getting a precise, powerful workhorse for your home shop, all with a convenient mobile base built in. CSA certified meeting CAN/CSA C22.2 #71.2-10 and UL 987 standards! Total table size: 8" x 76"
Fence size: 4-1/2" x 38"
Approximate shipping weight: 365 lbs. I bought this a month ago and I'm so glad I did. 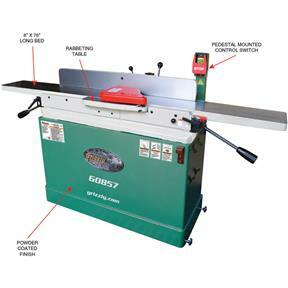 Plenty of power, reasonable cut quality. Love it. I purchased this two months ago and am extremely happy with the performance of this machine. Out of the box it was perfectly setup without any need to make adjustments, alignments, etc. 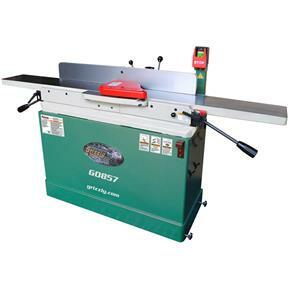 I've been wanting a new jointer for a long time, and finally pulled the trigger on this one. These things are tough to get with the backorders and preferred the spiral cutter model, but will add that later. Setting knives is a pain and can see what the spiral jointers are so popular. The good thing about this one is that it comes assembled and there's not much to do. Taking this puppy out of the crate is the most time consuming thing. I got it functional and ran some pine through to test it out. The 3 hp motor had plenty of power and the 4 knife head did well. This thing creates a lot of chips and I'm going to need a separator system. The base is made out of sheet metal and it's not as heavy as some other models, which can be a plus if you're a garage shop like me. I did everything by myself. The built it mobile wheels are nice. Unfortunately I had some shipping damage and one of my wheels was knocked in and rocks, but working on a fix. I almost got another 6 inch joiner, and so glad I got the 8. The big long bed on this is really nice.